Russia besides rich with landmarks and castles also pose many religions worship place. There are countless shrines, mosque, and monasteries. One of them is the Russian Orthodox Churches which vary in ancient, modern, wooden, stone, beautiful churches around Russia. It is a place to pray, celebrations such as Christmas In Russian Orthodox Church, and also Wedding Tradition In Russian Orthodox Church. However, there are some rules that one should know before visiting a Russian Orthodox wedding. In an Orthodox church, there are several things that become a part of church etiquettes. Even though there are many Weirdest Traditions Of The Celebration Of Russian Wedding, you shouldn’t irritate the parishioners. Even if you have a different view in terms of religion. it is best to keep your faith and opinion to yourself. The worst thing is to start an argument which is very rude. Do not forget that in Russia there is a strict law on religious beliefs and practices. Moreover, the law on the rights of believers is quite strong and has a tendency for heavy punishment. Therefore, everyone needs to be mindful not getting into any Prohibited Things To Do That Make You Get Arrested In Russia. There are no official rules on taking photographs inside a church. However, it can distract or annoy the church goers that attend the wedding (especially if you use a flash or typical sounds of the shutter). Therefore, don’t be surprised if someone orders you to put the camera/phone away. Therefore, it is important to be respectful. The worst thing is to start taking the picture without asking for permission and holding your cameras to people’s faces. There are numerous Foreigners Habits Considered Rude In Russia that they need to learn before coming to Russia, include being respectful to other private spaces. There is dress code when you enter any Russian Orthodox Wedding. 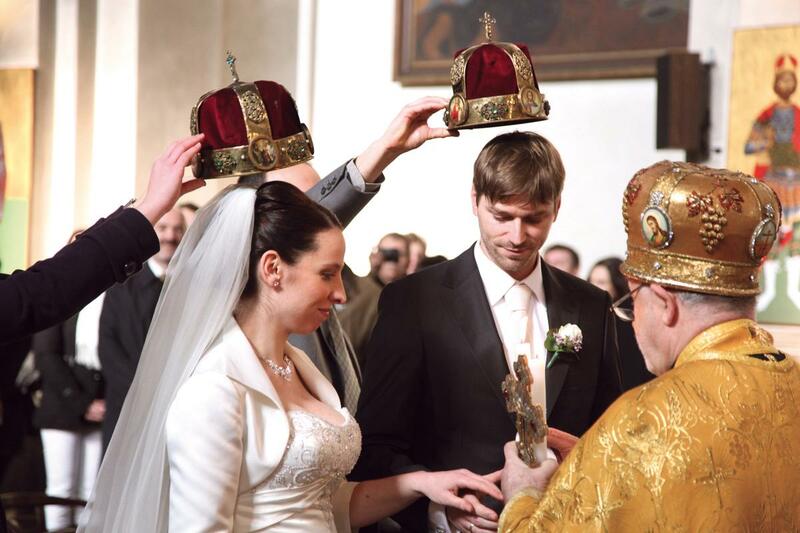 The rules involve in Wedding In Russian Style such as you need to remove your hat before entering the church if you are a man and women need to cover their heads with a veil. Although, the veil concerns actually apply only for married women since it symbolizes the husband’s power over his wife. However, But the original symbolism is long overlook and now everyone covers their heads: Women, young ladies, and girls. Women should also not enter any orthodox church in revealing clothing and bright makeup. Moreover, when a woman visiting convents, they should wear long skirts. Furthermore, it is also among the many Charming Appearance Of Russian Girls that dress in a modest and moderate way. Firstly, before entering the church on a wedding you need to cross yourself and bow three times. Moreover, you have to put the first three fingers together and touch your forehead, then stomach, right shoulder, and the left. After that. you need to cross yourself again after you’re inside. People often do a common mistake by crossing and bowing simultaneously. Moreover, you should bow in between the crossing and don’t make any mistake that might be noticed. Furthermore, this small gestures in a Russian Wedding Tradition is simple but crucial. Therefore, it’s possible a churchgoer may come over and give you some instructions if you didn’t follow the proper procedures. It is a common custom to turn of your phone. It is even stricter in an Orthodox Wedding ceremony. is better to switch your phone off altogether or turn off the sound mode of your mobile phone. It is compulsory to remain silent and respectful in the church. However, you can whisper, but only when necessary. Make sure your ringtone doesn’t violate the church’s silence then all the babushkas will look at you with disapproval. It is one of most improper things to never show to Russian friends. It is also a common social etiquette not only in Russia but also other parts of the world. It is important to walk gracefully in an Orthodox Church and mind your manners. You need to walk slowly, do not run, recite your own sermons, stage performances and during services it is better not to walk or pray near the icons. In accordance with the Orthodox church tradition, it’s necessary to remain standing for the whole ceremony. You need to be healthy and fit to stand for hours, even if there are benches and chairs by the walls. Those accommodations are for those who physically cannot stand. Any ceremony normally lasts about one and a half hours. So, if you are young and healthy think again of sitting in any Russian orthodox wedding. The altar is not a place for everyone. Therefore, only the priest and member of the church management can go there. If you are a guest, moreover not an orthodox Christian yourself. Don’t go to the altar or any other non public space in orthodox churches. You will likely get varied reaction from severe toa mild warning. Moreover, other Churchgoers will disapprove of your action and give you gently warning. Candles in orthodox symbolize many ritual and tradition. It is also the same with other church ornaments that its own purpose and value. Therefore, it is highly recommended not to disturb any of these candles. It is considered disrespectful and also come across very rude bot spiritually and culturally. Among the prohibited thing to do in an Orthodox Chuch include the proper ceremony sequence. If you see food on a stand in the church, there is a good chance it is not a buffet for the churchgoers. It is likely a prosphora (liturgical bread), but it’s only for those who have received communion. These bread and other decorative sweets has hidden meaning and symbols. Many churches also collect food and then give it out to needy parishioners not to the guest. Obviously, you must also not consume the food that you bring with you. However, Russia is a multi-confessional country, but most of its citizens are Orthodox Christians. So, most likely most of the guest who attend an Orthodox wedding understand it. The happiest day of the bride and groom also involve guest congratulating the happy couple. However, there are also prohibited things in an Orthodox wedding that people need to be aware of. There is the proper expression on how to congratulations that slighly differ from the typical wedding day. Moreover, it is important to understand the social norms around an Orthodox wedding ceremony. In the Russian Orthodox Church, there are a lot of customs and traditions that are important on wedding tradition in Russian Orthodox Church culture. Moreover, from time-to-time, there are various etiquette issues about the do and don’t in Orthodox Church so the people can understand each other and work together. There are the do and don’t that At the end of the day, going to an Orthodox wedding is actually quite an experience, one that you dont get to to have outside Russia.